Can you remember when you were a teenager? I think I would be safe to say not many of you were composing chamber music at that age. 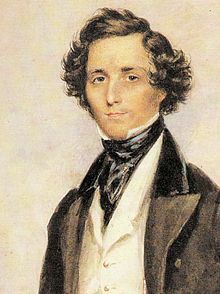 Well, the 16 year old Felix Mendelssohn was not only composing music at that age but he composed one of the greatest and most beloved chamber music pieces ever composed - His Octet in E flat Major [composed basically for two string quartets]. The German born virtuoso pianist was one of the great composers of the early Romantic Era of music. If you had to limit yourself to one word to describe Mendelssohn's compositions, I believe that word would be melodic. His compositions contained some of the most beautiful melodies ever composed. Despite his short lifetime of only 38 years, the world has been blessed by this musical genius prolific number of compositions in almost all genres of classical music. Mendelssohn's Octet was scored in E Flat Major for 4 violins, 2 violas and 2 cellos, and it has four movements: 1. Allegro moderato ma con fuoco; 2. Andante; 3. Scherzo; and 4. Presto. The first movement, with its mesmerizing theme, is one of my most favorite movements of any chamber music piece. Please turn up the volume and enjoy this great classical music teenage brilliance. Michael - This is, of course, Wonnderful!